LOS ANGELES — At the Los Angeles Auto Show last week, automakers served notice that they're going electric, and introduced a few new models to some applause. But the lustiest cheers were for something else: the new Jeep Gladiator, the welded union of a Jeep and a pickup truck, which bounced its 17-foot-long, gas-guzzling self onto the stage over a pile of boulders. So stands the auto industry's cognitive dissonance in the year 2018. To please regulators and put the brakes on climate change, automakers are planning electric cars for tomorrow. But to please drivers, they're building huge, mostly gas-powered bruisers for today. The LA Auto Show, one of the nation's biggest, is where the greenest and most high-tech models make their debut. The backdrops of every booth featured beaches and forests. But the big product reveals by companies like BMW also revealed paradoxes. Bernhard Kuhnt, the CEO of BMW of North America, started out with condolences for the victims of California's wildfires. Then he went on to introduce a slew of new gas-powered models, whose carbon emissions will make California's droughts and wildfires worse. First up was the X7, the company's largest SUV ever, intended to chase its competitors' biggest hits, like the Lincoln Navigator and the Audi Q7. "It's big, it's bold and it has incredible on-road presence," said Pieter Nota, a member of BMW's board of management. The X7 has a vast chrome grille and so much interior room that captain's chairs are optional in the second row. 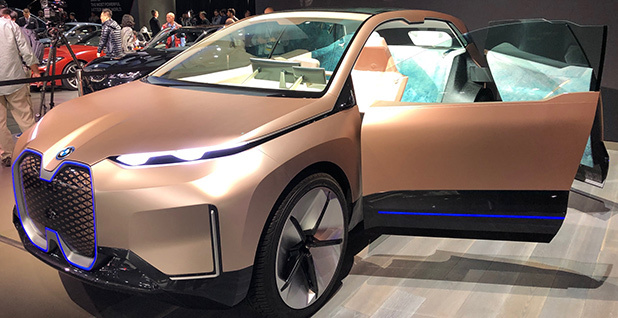 Finally, the German automaker softened the blow with the Vision iNext, an electric concept SUV with peach-colored skin and coach-style doors. Later, BMW's head of government affairs, Thomas Becker, called it the German automaker's "one vision vehicle" that will result in a model by 2021. Crossovers, or sport utility vehicles based on the platform of a car, are enormously popular among American drivers as gas prices remain low. Most carmakers — maybe "car" is the wrong word — made it clear in LA that they don't see that roomy appetite shrinking anytime soon. Hyundai, for example, debuted the Palisade, its largest SUV ever, a seven-seater with reclining seats in the third row and an intercom so the driver can communicate with the rearmost passengers. "We're in the SUV game big-time!" yelled Brian Smith, the chief operating officers of Hyundai Motor America. Over at Porsche, there are plans to roll out an all-electric sports car called the Taycan next year. But in Los Angeles, Chairman of the Executive Board Oliver Blume was on hand to reveal a refresh of the gas-powered Porsche 911 — while announcing a donation of $250,000 to the Red Cross for California wildfire relief. "More than 70 percent of all 911s are still running," Blume said. "That's what sustainability means for us." To be fair, not all electric cars were in the future tense. Kia, the Korean automaker, unveiled not one but two new pure electric cars for 2019: the Niro SUV and an electric version of the Soul, its traditional leading seller. Both will share the same electric architecture and ranges of over 200 miles. 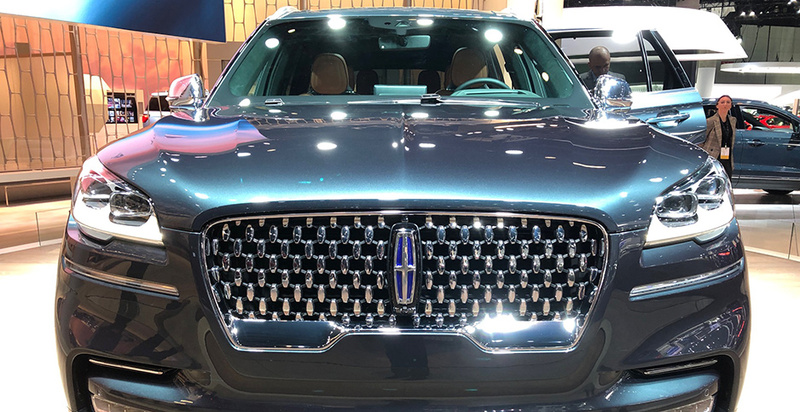 And Lincoln, the Ford Motor Co. marque that has never ventured beyond petroleum, created a plug-in hybrid version of its titanic new crossover, the Aviator. The plug-in hybrid can be used to raise the vehicle's oomph by 50 horsepower, to 450 horsepower, or downshift to two electric driving modes, one that stills the gas engine entirely and one that saves fuel. The Aviator's two modes — power versus power savings — get at the central conflict of big cars in the coming electric age. To have the long range that makes them competitive with gas, electric cars need to be light and streamlined. But crossovers are heavy and sit high. Dave Cooke of the Union of Concerned Scientists said in an email that according to its studies, crossovers consume on average 14 percent more fuel than a traditional car. Turning heads at the Los Angeles show was the Rivian, a new all-electric truck and SUV, which promises a range of 400 miles and a velocity of zero to 60 mph in three seconds. The booth of this "electric adventure vehicle," due out in 2020, crawled with photographers. Mary Nichols, chairwoman of California's Air Resources Board, toured the floor and said she came away encouraged. "Even the ones who are doing nothing with electrification are still coming out with cars that have better emissions and better fuel economy than they did just a couple of years ago," she said. Some automakers gave their existing electric models prominent showroom space, including Range Rover, which reserved a corner spot for its plug-in hybrid, the Sport. Chevrolet showed off several all-electric Bolts and even a bright blue Volt, though the company broke the news this week that that groundbreaking plug-in hybrid would be discontinued. "We're seeing more diversity in the size and type of cars, and that's what we're going to need," said Dave Reichmuth, a clean-vehicle specialist at the Union of Concerned Scientists, who attended the show. But, he added, that isn't yet translating into sales. "You look at the showroom, and you see a lot of electric cars," he said, "but the cars people are going to be buying are gas-powered cars." Audi, which debuted its new electric e-tron sedan this fall in San Francisco, teased a sportier GT version in Los Angeles, due for production in two years. Its interior is entirely vegan, including floor rugs made from recycled fishing nets. At the Volkswagen booth, Scott Keogh, the CEO of the U.S. division, talked up a prototype electric delivery van and proclaimed that his company would "bring EVs to the millions, not just the millionaires" (Energywire, Nov. 29). Today, however, its runaway hit is the Atlas, a seven-seater with the tagline "Life's as big as you make it" and a combined city-highway consumption of 19 mpg. 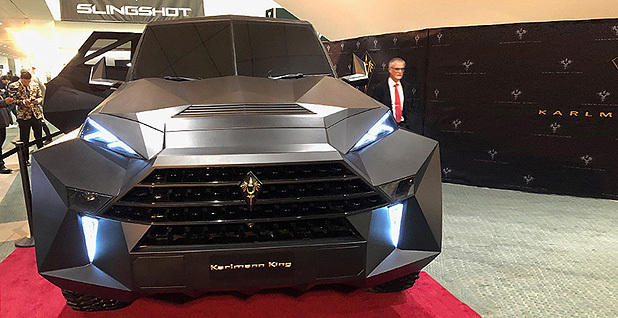 America's fixation on bigness found no better avatar in Los Angeles than the Karlmann King, a hulking, angular black brute that looks like a stealth fighter on wheels. Weighing in at 10,500 pounds and more than 8 feet tall, it has so far found 10 customers ready to pay its $2 million price tag, said Michael Nothdurft, the brand's sales director. Asked how many miles it gets per gallon, Nothdurft said, "We don't know, honestly. Between 6 and 8. We don't care, and our clients don't care." Then, echoing his more well-established cousins on the show floor, he concluded, "If we build it in the future, it will be electrical."